Summary: The Infant Optics DXR-8 is aimed at parents who want to remotely monitor their infant. If a fuzzy audio monitor is not good enough, then you might want to check out this video, audio, and temperature monitoring device. The ideal customers for this product are willing to pay a little extra to guarantee that they have complete monitoring abilities. For parents, leaving a baby alone is stressful, even if the baby is just down the hall. When my daughter was a baby, I knew I needed to let her learn to fall asleep on her own, but I was afraid she could be in danger if I left her alone. Baby monitors provided the obvious answer to my problem, but there were many monitors to choose from. Having researched the options in depth, I can now provide the inside scoop on the Infant Optics DXR-8 monitor. This Infant Optics DXR-8 bills itself as the first baby monitor with interchangeable lenses, allowing parents to remotely view their children with a normal lens, wide angle, or zoomed lens. The receiving end of the device has a color LCD display and a number of extra features that provide parents all the tools they need to monitor their infants.It provides the same basic functionality as similar devices, with a focus on functionality as opposed to bells and whistles. The device comes from Infant Optics, which has been producing leading baby monitors since 2011. In addition to its unique devices, the company offers live customer support by telephone, every day during business hours (9 am – 5 pm Pacific). Interchangeable lenses: This product provides you with 3 lenses: normal, wide angle, and zoomed. While this is feature is unique, you might wonder why it matters. It matters because having multiple lenses makes the camera adaptable to whatever room you want to use. You can mount it in on a wall using the wide-angle lens (sold separately), in a distant corner using the zoom lens, or near a crib using the normal lens. Color LCD screen: The screen is somewhat small (3.5”), but is in color and has better resolution than most baby monitors, making it easy for you to see the infant on the other end. Night vision: Your primary use for this device will probably be to watch your infant at night-time. The night vision lets you do that with ease. Remote camera movement: The monitor device enables you to zoom, pan, and tilt the camera. If you want to look around your infant’s room, you can easily do so.If the monitor picks up a loud noise in your baby’s room, for example, you can look around to see what caused the noise. Battery life: The monitor is designed to last 6 hours during screen use or 10 hours when in “power-saving” mode. Note, though, that some users report shorter battery life.If you have the monitor plugged into the wall next to your bed, the battery life might not matter. If you plan to walk around with the monitor, though, the ability to do so for several hours at a time could be important. Audio capabilities: In addition to watching your infant, you can listen to your infant using the microphone built into the camera unit. A digital audio indicator shows you sounds even when the audio is turned off, alerting you to unusual sounds in your infant’s room.You can also speak to your baby through the device. Use with multiple cameras: If you buy additional cameras, you can use them simultaneously on a single monitor. Note, though, that the monitor does not provide split-screen viewing, and instead switches between cameras.This multi-camera ability could be important, for example, if you have two young children sleeping in separate rooms. Solid customer support: Some buyers of this baby monitor have reported receiving defective units, but the good news is that you can rely on the manufacturer’s customer support. The support team is composed of real people (not computer menus) who can help you with any problems. I had trouble installing the battery. The deal breaker for me is the charger, which does not connect properly to the monitor and finally had to be attached with duct tape. Lisa G.
After only six months, our monitor has completely stopped working. I have seen many other reviews from people whose device fails after a few months. Andrea K.
When I called customer service, they told me to provide proof that I had purchased the baby monitor before the fixed the problem with my unit. Because I received this as a gift, I could not prove ownership and did not receive support. Unless Samsung’s unique features are very important to you, the Infant Optics device is probably a better option. Because the two products have virtually identical prices, though, you should definitely pick the one that has the features you value most.There are numerous other competitors on the market. PCMag.com, for example, praised this device but thought it was less impressive than the Withings Smart Baby Monitor.Other similar devices include the Motorola MBP36 and the Philips Avent SCD603. Although the InfantOptics.com website provides information about the device, it directs customers to Amazon.com to purchase. The retail price is $229.99, but Amazon.com sometimes marks it down to $165.00 or so, and it is available with 2-day shipping on Amazon Prime. The screen does not have to be on all the time. You can set it to turn off after 3 or 5 minutes. The camera can be mounted on a wall or piece of furniture. There is a slot on the bottom to be used for this purpose. If you use multiple cameras, the screen automatically switches between the camera streams, and can be switched manually. To establish a secure connection between the monitor and the camera, the two devices are paired at installation using buttons located on each component. Most potential buyers of baby monitors want a device that will enable them to see and hear their infant with easy. This device accomplishes that goal and will be more than adequate for most customers.High-end monitors can involve frustrating installation issues and, occasionally, defective components. The Infant Optics customer support team has mostly positive feedback, which could be a benefit. Although it does not include every conceivable feature (e.g., it lacks the Samsung device’s built-in night light), this product includes all the core features that users expect, along with some extras. If you are in the market for a high-end baby monitor, you should definitely take a look at the Infant Optics DXR-8 HERE. The Infant Optics DXR-8 Video Baby Monitor is one of the best I’ve got. Since I realized the importance of a baby monitor, I really can’t do without it. It’s quite helpful and I’m glad I got this which is quite efficient and durable. Good to come across this review. I think I will give this baby monitor a try, the last one I got wasn’t so nice – didn’t really meet my expectation. Will try this out. Thanks for the update. Thanks for the great review. I actually got this baby monitor and it’s really nice. Came with features exactly as described here. Interesting! I really don’t know much about baby monitors, I just stumbled to this post and this is just what I need to get now to keep more watchful eyes on my baby. I’ll get one ASAP. Thanks! Hi, me and my wife both have day jobs and one day my baby son John was sleeping and we were out. We don’t know when he woke up and he ate random things and all. It got me thinking that he might have eaten something dangerous. Searching about a solution, I got on this page and I love the concept. I’m gonna buy Infant Optics DXR-8 Video Baby as I need full control. Hi, it’s funny. I came to your website looking for the best strollers and one way or another I ended up on this page. I never knew that there are baby monitors available in market. Which one do you think is the best? 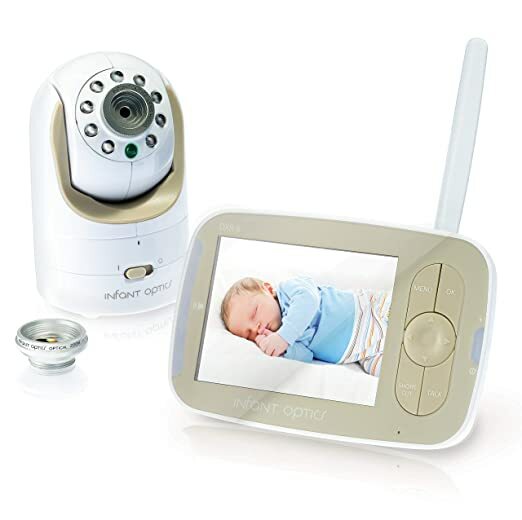 I like the “Video Baby Monitor with Digital Camera” as it is economic and has good features. Please let me know!